There's a new box on the block at Brew Ville: Muskoka Roastery Coffee Co. Actually, there's 4 new boxes that make up this delicious line of Canadian coffee. Choose from Howling Wolf Medium Dark, Muskoka Medium, Loon Call Breakfast Blend and Black Bear Dark. "Our handcrafted blends were developed in, and inspired by Muskoka. Coffees like Black Bear, which delivers a bold, well oiled, smokey taste with a growl. Or our signature flavoured coffee, Muskoka Maple, that starts with a blend of South and Central American beans, and then adds a subtle flavour that evokes memories of a cold, clear spring morning at the maple sugar shack." "In 2016, we became one of the first companies in the world to introduce certified 100% compostable single serve pods. 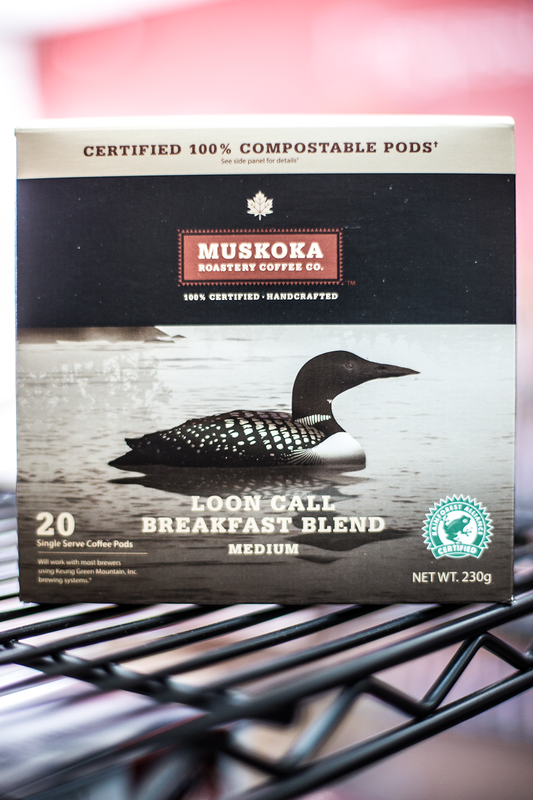 The Muskoka Roastery is also a Carbon Neutral company, and we are striving to achieve a Zero Waste target." With so many options to choose from on our walls, what sets Muskoka Roastery Coffee Co apart for us at Brew Ville? They are proudly the first roaster in Canada to achieve 100% Rainforest Alliance certification and their pods are completely compostable. Muskoka Roastery also gives 1% of their sales back to the community every year. This company is grounded in unsurpassed quality and we can tell with every sip! Come by Brew Ville to try all the new flavours.